Adventure in Kaunas day 2. Having orientated where I was, I settled on my pillow to thank God. It was an easy, joyful moment of prayer simply: ‘Thank you Father, you were brilliant yesterday”. He had provided, He had shown himself as real and kind, He had totally taken care of us and given me evidence of the reality of His power and goodness. I giggled with God about my journey of doubt, fear, anxiety and maybe even testing him on the way to Kaunas. Having landed connection, provision and accommodation the previous day, we had no plan, the day lay open before us, nothing fixed until 4pm. When you are trusting God for his provision and can’t buy your own lunch, you have a whole chunk of day available. We walked around the town, open to whatever God brought to us and he didn’t bring anyone, so we rested and trusted. Our staff team at St.Chad’s are all detailed planners and I’ve built up a reputation that in contrast to them I’m not. I like spontaneity, I respond to the urgent, I try to let tomorrow take care of itself until deadlines force my priorities. It turns out however, that this isn’t true. I like plans, I live with an agenda, purpose, target and to do list full of objectives to achieve. This was God’s next agenda item for my learning. Having prepared for the trip, built up for weeks the intensity and purpose, suddenly we just had to wait and be available. Having no targets was a new form of powerlessness and dependence upon God. I engaged with whole layers of frustration, anxiety and guilt at the difficulty of having nothing to achieve, these made me profoundly rest-less. It took me until mid afternoon just to enjoy the place of rest and provision, just to receive the gift of a day in the sunshine, in a beautiful place with two friends, to chat and explore and laugh. To receive rest as a gift is an act of obedience. It’s amazing what you see in a city when you have no money. Cutting out the whole paradigm of being a consumer, means you ignore shops, cafes, restaurants and advertising, you have no access to paid tourist sites. Block these out and you see more beauty in a city, the people, buildings and what’s in the gaps. Pilgrim not tourist from Andy Crouch ‘Strong and Weak’. As a pilgrim not a tourist, as a missionary not a consumer, I was more able to see the city through God’s eyes and let his love for it grow in me. We visited a series of Catholic churches, and just dwelt there, enjoying the majesty and praying. This was God’s next gift to me. A radically new love for those many Catholics who are earnestly seeking for God. In every church we visited there were women, silent in prayer. We sat in the stunning Cathedral and enjoyed the art and architecture and then sat silently in the side chapel, a designated place of prayer, a helpful sign refused mobile phones and cameras. Raised and trained as a Protestant Anglican, having studied theology, and pondered extensively for my book on ‘hollow religion’, I would have been very sensitive to the contrasts of this place and its traditions to the theology of the wing of the church I dwell in. The reformation is an unavoidable part of our theological history and I believe God worked through it. But having met the young passionate worshippers the day before and knowing God had taken us there to bless and pray, my focus shifted. Not analysis, not comparing, not reacting, but choosing instead to bless. I believe the Holy Spirit lives within us and wants to get out. As I prayed, I simply asked him to pour out from within me and dwell in that place. God gave me a deep love and longing for the many people who go there to seek him. I simply prayed for that to increasingly become a place of encounter. We all need to encounter God, we all need those moments of connection with the one who loves us, forgives us, accepts and welcomes us. To be in this place of prayer, I was touched by the many who go there daily to be with God. Some with a longing generous heart of gratitude or petition for God’s blessing on others. But also those who were there in fear and superstition, those there in duty or religious process of trying to appease God or earn his favour. In simple longing, I asked the Holy Spirit to establish these church as wells of living water. That those consumed by religious superstition, fearful duty, or shame or striving to earn his favour, would be surprised by Him, encounter his grace, acceptance and unconditional love. God had taken me there to deposit a blessing, and to shift my perspective. God took me to a Catholic city, to pray for renewal, for hope and the fact He had done this demonstrated his abundant love which transcends theological differences. It was a simple moment of theory becoming reality in my life. Millions of Catholics across the world have a hunger for God and barriers which would prevent them finding him in other denominations. So how about this for a strategy from the Holy Spirit: to bring renewal of faith, grace and the good news within the Catholic Church? I prayed for Pope Francis, a man God has called to shape history. At 4pm we attended a BBQ at the Youth Centre we’d connected with the previous day. It was great to hang out with the students and encourage them, we went on to a Taize service which was beautiful space to worship and subtly intercede for those around us. Then open to God we just lingered to see what happened. Two young men turned up, Matas who we’d met the day before and Teddy, who we had never met. Amidst banter and some random linguistic cultural exchanges, we saw in them a hunger to connect, to cross the first layer of chat and talk with us more deeply. When the centre closed, they left with us, taking us to climb a hill and enjoy stunning views of the city. This became the next set-up from God. As we walked and talked with them, they opened their hearts. As three church leaders with a longing to empower and disciple young men, God had taken us to two young men who needed wise counsel and encouragement. The Holy Spirit was at work in all five of us that night. Reflecting back, this trip wasn’t just about God teaching us to trust, rest and love others from different church traditions. Much of the reason we went was not for us, but for them. Pilgrimage and mission are about being available to God to bless others. God chose to use us to impact them (and vice versa) We didn’t go merely for risk and adventure. We went for them, we went with a desire to bless and God used it. Matas wanted to used his last €16 to buy us a simple Pizza to share, as we arrived at the restaurant he bumped into a Christian friend, as he explained what he was doing, this friend gave him €10 to bless us. We were able to feast on pizza, beer and friendship. Our final unanswered prayer (to taste Lithuanian Wheat-beer) was now fully answered. Having read this story, how will you approach tomorrow? I live and serve in suburbia and a large national institution provides me with a comfortable life. Almost every activity and ministry I do is required to have a risk assessment. I long to see the power and provision of God…. 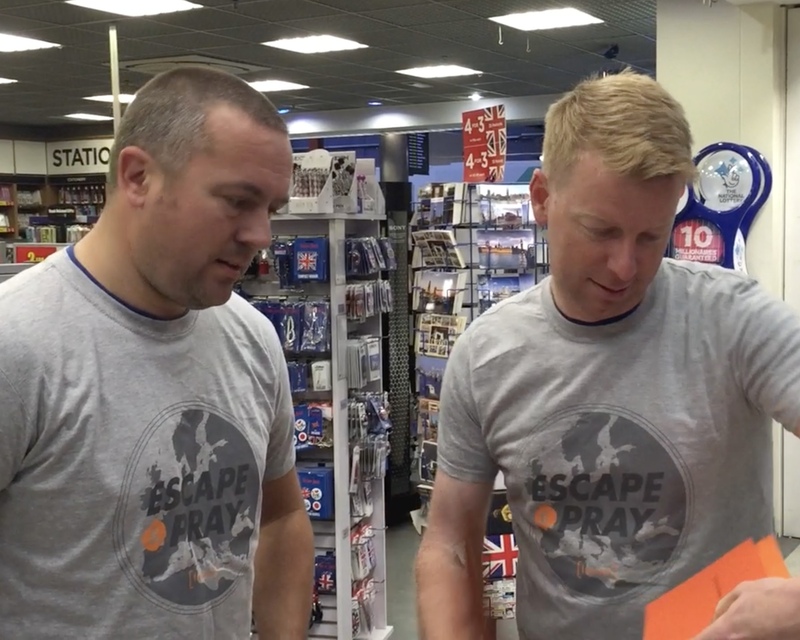 In March I bumped into my friend Luke Smith, when I mentioned my sabbatical, he asked me to join him for Escape and Pray in the summer, I couldn’t grab an excuse fast enough so I ducked the offer with a promise to pray about it. Within a few hours as I listened to a talk on risk and adventure, the Holy Spirit nudged me and said “If you really want to see me work, then you’ve got to put yourself in places where you depend on me”. I vowed to the Lord that I’d say yes to Luke. 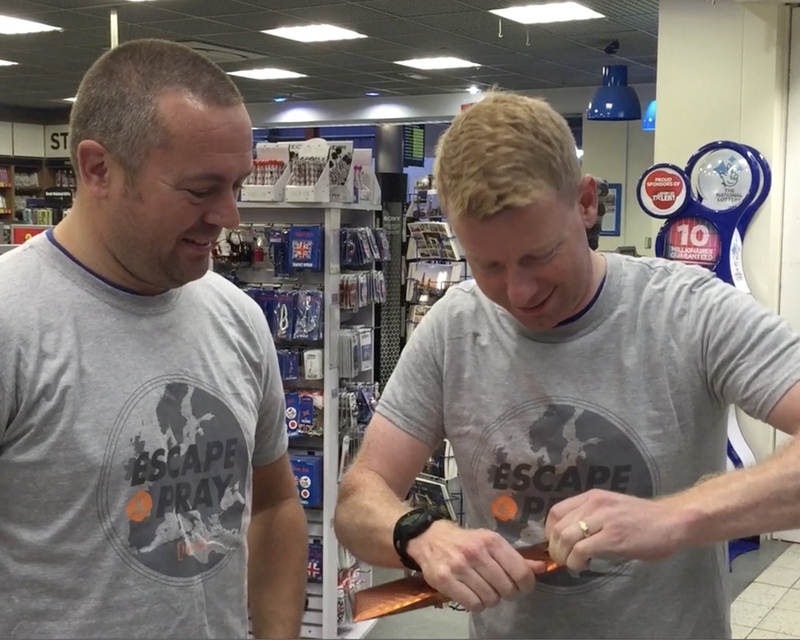 Escape and Pray is a wild initiative run by Fusion an amazing organisation which equips and inspires students and churches in mission together. This June they are sending 333 people in 100 teams, (mostly students) into Europe to pray for a move of God in universities across the continent. Each team is sent a pack plus a date and time to turn up at a certain airport. When they arrive, they open the pack put on their T-shirts and open an envelope to discover where they are heading and their flight tickets. They go with no food and accommodation booked, (just €20 for emergencies) they trust in God to provide. Luke Smith: works for Fusion, building teams, linking with churches and having creative radical ideas. He’s become a good friend in recent years, including our shared love for sport and sympathy in being ginger. Dave Tonks: a brilliant Scouse church leader from Chester, who I had never met before Monday, but will be a lifelong friend now. The team dynamic was a highlight of the trip, great honour and support, easy communication and quality banter. I loved spending time with them both. Pronounced (Ko-nus) is the second city of Lithuania, population is c.300,000, of which 50,000 are students. The city centre is beautiful, at the intersection of two rivers it has a clean, open, gentle feel to it. Some traditional architecture survived the Soviets and many churches and older buildings too, we walked past many stylish cafes and bars. It is somewhere I’d take Nells back to for a romantic weekend! 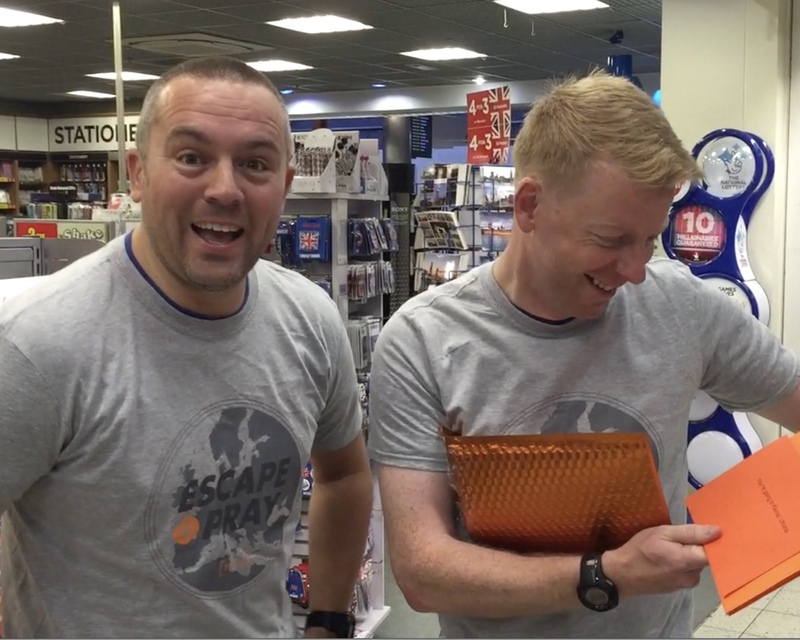 We arrived at Luton at 6am on Monday morning and opened the envelope to discover we were heading to Kaunus in Lithuania, to be honest, none of us had ever heard of it! We looked around the city, found a prominent church, which was beautiful but no one spoke to us. We walked down the main street and an old man enthusiastically chatted to us, attaching himself to us as tour guide. He led us to the old town, and disappeared. There we found an Ignatian college, Luke is pursuing the Ignition scripture meditation exercises and we were there for students so we rang the doorbell. We were immediately welcomed in, we explained our story and purpose and asked to meet and pray for the college director. The kind woman who let us in took us upstairs and found some colleagues including the English teacher. We chatted for a while, asking about the college, its Ignatian principles and as we did so, my caffeine addiction kicked in. I simply thought ‘I wonder if they’ll give us some coffee’. Within seconds our host interrupted herself and said “Sorry, we’re standing, come and sit down, would you like some coffee?” They were lovely, and over coffee, water and amazing biscuits gave us insight into the city and directed us to the local Jesuit priest and mass at his church at 5pm. He then phoned his friend Agne and said I’ll take you to meet my friends. We walked across the city square and into a building to find ourselves in the Kaunas Arch-diocese Catholic Youth centre. We met a couple of the staff and some of the students, who used it as a social base a bit like a Chaplaincy. Their English was amazing, (true for all those under 25 we met) and they invited us in, offering food and drinks. A group of about 12 students and youth centre staff gathered around and we talked. We discovered that they were passionate for Jesus and shared our taste in worship music and hunger for the Holy Spirit. Ange made a couple of calls and then told us that she’d sorted out accommodation for us in a spare room in a local seminary. After a while someone suggested we worship and pray together. We went through to an open meeting room, someone opened in a brief liturgical prayer and then we worshipped, all facing the cross, with a guitar and songs with familiar tunes but in Lithuanian. It was spontaneous and passionate worship of Jesus. Luke, Dave and I then offered to pray for each of them, so we went round as they worshipped and laid hands on each on, sharing specific prophetic words for each of them and encouraging them. It was stunning in every way, to see the Holy Spirit impact them and to see their freedom, joy, friendships and desire to know God. Just like earlier in the year in Mumbai, God reminded me that the simplest way to cross cultural barriers is to boldly lay hands on someone’s shoulder, speak out prophetically whatever the Holy Spirit gives me and pray for healing wherever possible. After that, we were taken out of the city to a retreat house log cabin in the woods, where a team were training and preparing for a children’s camp this summer. We shared our story and then we offered prophesy or prayer for healing to everyone. There were about 20 teenagers and students there (and a Nun) and they all came forward to be prayed for. We prophesied, prayed for personal needs and for healing. One 17yr old lad who had lung problems (asthma, I think) said he felt extreme heat in his lungs as I prayed for him and then they felt very clear and breathing easier. The Nun was so humble and hungry for God and asked me to pray for healing for her too. We played silly games with them late into the evening and then returned to Kaunus and taken to the empty seminary building, where beds had been made up, we had our own kitchen, bathroom and they gave us food for breakfast and the next day. From our window we looked straight onto Kaunas’s Medieval fort. Before God acts, all we have is trust. As we flew there, I trusted God would provide, but I had no idea how and I had a whole bunch of fears about worse case scenarios. Underneath each of those fears was a lie about the character of God. One of those fears for me was that God would provide for other teams, but not us. I had to recognise and let go of a bunch of lies: That we didn’t matter to God, that we didn’t have enough faith and that it depended on us and that God might make it hard for us to teach us a lesson. God had us totally available, because we were dependent upon him. So he took us somewhere we’d never have planned to go, and took us to a group of people whom he wanted to encourage. This trip wasn’t just for us, it was for Kaunas, for a community of young disciples of Jesus, to see that God is real and that they matter to him. Do we know how to pray for salvation? The Church of England is shrinking. During that week, new statistics came out with harrowing evidence that attendance in Anglican churches is still in decline and weekly attendance has dipped below 1million. There is a growing urgency and momentum in radical and bold thinking about church growth. Whilst you could be excused for believing that the only thing senior Anglicans talk about is unity and sexuality, the reality is that a lot of leaders are very aware that if we want to turn things round and see change, we have to change what we’re doing, how we’re doing it, and assess why we’re doing it. There are many facets to this: church growth, decline, attendance, sociological change, ‘Christendom and the kingdom’, and much more. I came away from the course focussing on one aspect: Prayer. I am convinced that the Church of England won’t grow until we get serious about praying for salvation of those who are not following Jesus. As I engaged afresh with the complexity of numerical decline and the place of the Anglican church in the UK, what grew in me was a stronger and stronger passion to pray and to motivate others to pray for the salvation of those who don’t know Jesus. I first drafted this blog on the day I got back from the course, but have sat on it for a few weeks, mostly due to busyness, but also a sense from the Spirit to wait and ponder. This weekend the Archbishops have announced an initiative for the week of Pentecost to inspire Christians to focus on an intense week of prayer for evangelism. Excellent news. do Anglicans know how to pray for the salvation of non-believers? Is praying for ‘salvation of those outside God’s kingdom’ core to Anglican spirituality? Are you ready for a broad sweeping generalisation with no data to back it up? To ‘remember before God’ with empathy: the sick & those struggling with challenge. And more traditional Anglicans will follow the biblical mandate to pray for the Queen, Bishops etc. What if you ask a group of Pentecostals, or members of new church movements? I think the focus would be for the salvation of people in their community and transformation of society. As a brash young curate I wrote a course called ‘Intercession made slightly less complicated’ which had a contrast as it’s central premise. On the other, Intercession being a passionate, sacrificial, extended process of crying out to God for the lost to be saved and communities transformed. One of the key things I learned on the course on church growth, was research (found here ) that the characteristics linked to decline are: empathising, persisting and managing. Whereas characteristics linked to growth are: motivating, envisioning and innovating. Manchester at dawn – my love for a city grows as I pray for it. In my experience, motivating (encouraging, inspiring, calling, urging) others to pray is most effective when we inspire with a vision and a target. For empathetic prayer this is the comfort or healing of those in distress, by contrast much Pentecostal prayer is motivated by a longing for Revival or Awakening. We pray, because we long for something, so a starting point is to question what do our hearts long for? If I had the skills, time and money I would love to do a statistical research to assess how the content of different church’s theology of prayer is linked to church growth or decline. I believe for the Church of England to stem the tide of decline, the first strategic step is to learn to pray. Teaching prayer isn’t as easy as I thought it would be. It’s hard to measure invisible results. It’s a reality that we are one body with diverse parts, passions and priorities. When a leader preaches ‘we need to pray more’ or better still says ‘let’s pray’ – then that means a vast range of things to all those listening. In my sabbatical this summer I’m committing some time to study and research this challenge more. As I’ve reflected on this subject and my own weakness in this area, I’m aware that it’s actually quite challenging for some to call others to pray for individuals to be saved. How confident are we to publicly lead others in praying for the rescue of those who don’t believe they need help? We have to overcome the sensitivities that we’re praying for people we know and love to repent and change, how will they react to knowing we’re doing that? Are we somehow uncomfortable with them knowing that we believe they need rescuing? Or we’ve got to overcome disappointment, where we or those in our churches have prayed for decades for friends or family and then seen them die without knowing if they did turn to Christ. Or maybe we know deep down that when we pray, God will also call us to action, so we back off a few steps back. It takes boldness to call people to pray for the salvation of those whose backs are turned to Jesus. I’m delighted to hear that bold leadership from both Archbishops, calling the Church of England to prioritise prayer for salvation this Pentecost. Can I encourage us to really think now about how we can prepare and resource our congregations to know how to pray for evangelism. I would love to hear other’s perspectives on this. On June 16th I will be joining the Fusion team for their Student-link-up Challenge. 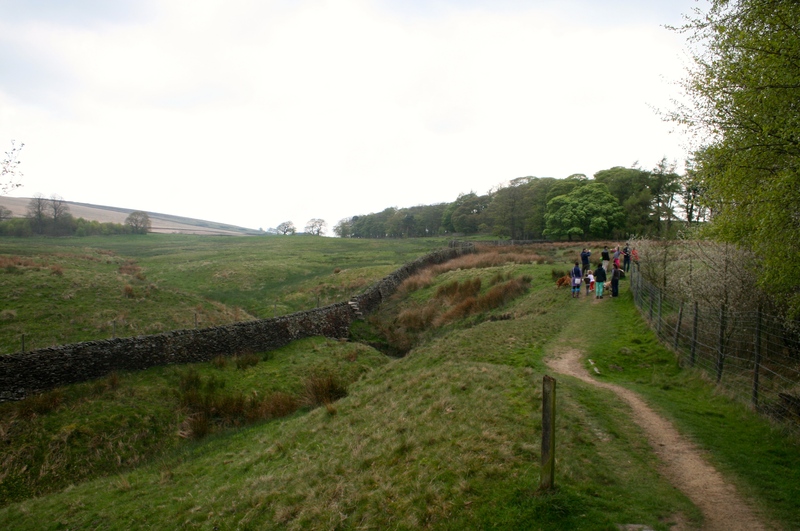 I’ll be stretching myself to the limit with the gut-busting, fear-crushing endurance feat of walking 10 miles in the Peak District late into the night. Ok, its an evening stroll in a stunning location in mid June with an inspiring and joyful bunch of people and I’ll take Biscuit (our golden retriever) along for company too. The endurance element will be for those who are doing the full 50 miles over the two days afterwards. I’m not doing this to impress anyone and I’m not asking for sponsorship based on my efforts. i’m doing this because I want to support Fusion and to raise the profile of the simple strategic work they do. however I’ve now had an offer of a generous sponsorship donation if I wear a Chicken Costume for the walk. (& then take a video of me being chased by Biscuit in my chicken costume) – Would you be happy to contribute a bit to see that happen? I’ve been a fan of Fusion since they launched in 1997. It is a small charity with a national focus. Their core vision is to enable young people heading off to University to link up with churches, to resource and empower church based student mission and to enable graduates to integrate into churches once uni is over and done with. What impresses me is that its a simple, crucial vision and they do it really well, with passion, joy and creativity. So why does this rate so highly on my list of things that matter? Every year 500,000 young people go to Uni in the UK. A rough estimate is 20,000 of them come from home churches where their relationship with God has started and their faith nurtured through family and youth groups. Tragically many of these young people in a swirling changing world of university haven’t found roots in a local church and miss out on the essential flourishing which is available through being connected with God’s family. Those who do find churches, find encouragement, discipleship, wider friendships outside the student bubble and support and wisdom to help them in mission to their student mates. Fusion through Studentlinkup (www.studentlinkup.org) helps students find churches and helps churches look out for and welcome new students. Their new app is genius and the whole process is so essential & strategic for the kingdom in the UK. 500,000 freshers in the autumn. 27% Christians find a church if left to their own devices. 2. I really believe in Church-Based student mission. The university landscape and student experience have changed dramatically over the past 2 decades since I went to Uni. Now there isn’t student culture, there are a myriad of student subcultures and the best people to bring Jesus to any of these are students themselves, but I believe they need to be rooted in local churches to stay sane and fruitful in that. I wasted 3 years of my time at uni on student Christian politics and attempting to build church without the maturity or training I needed. I burned out, got jaded, religious, argumentative and proud through the experience, when I look back now I’m gutted that I wasted so much effort. Without the wise support of a mentor and a Christian network outside of Uni, I might have walked away from church bitter and cynical like so many others have. Healthy churches, with mature student workers, biblical teaching, wise counsel and normal-life support can keep Christian students alive, they can also prepare young adults to be part of church after graduation. So I’m going for a nice evening stroll in June with a Chicken suit, an excited puppy and a purpose. I want to shout from the hilltops of the valuable work Fusion are doing and ask you to join me in supporting it. Please pray (not that I can walk 10miles on a summer’s evening!) but that thousands of young people will link in with student linkup and if you can give a little (or a lot) to sponsor the pilgrimage that will resource Fusion to keep on their simple but strategic work, which is built on fantastic core values. You can sponsor me here.